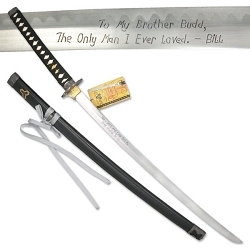 On Saturday October 5th 2013 we will be having actor Michael Madsen sign a very limited number of Kill Bill Budd sword replicas for us. A total of only 30 pieces. 2 versions to choose from below. the first version is limited to only 25 pieces the 2nd version is limited to only 5 pcs. Each sword will include a C.O.A. and the more expensive version will include a cloth storage bag. Swords will ship out before the end of October. He will sign to your name if you would like. 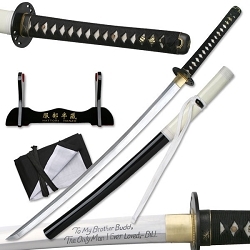 If you want your sword signed to a name please put the name of the person in the order notes (first names only) if you leave it blank it will be assumed that you just want his signature.